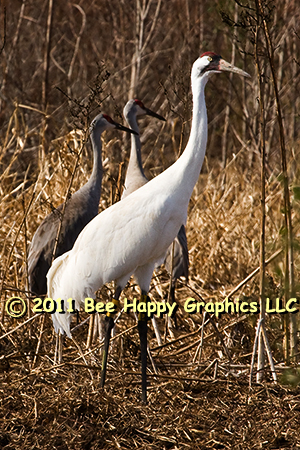 This picture was taken at the end of December, 2008, as a whooping crane (Grus americana) hangs out with a flock of smaller sandhill cranes. This bird is one of the few remaining from an early attempt to reintroduce Whooping Cranes to the Southeast. Because of those whooping cranes’ inadequate response to predators, the Paynes Prairie experiment was discontinued. Canvas N/A 18" x 13"